Meron Benvenisti is the Middle East expert to whom Middle East experts go for advice. Believe me I know. As a reporter for the New York Times in the Middle East for nearly a decade, I learned the difference between the mirage and the oasis. Meron is an oasis of knowledge in the intellectual deserts of the Middle East—deserts where charlatans and ideologues, hucksters and holy men, regularly opine and divine, unencumbered by facts, history, or statistics. Whenever I wanted to cut through this mirage to the real, solid bedrock of what was happening and why, I called Meron—confident that his take would be original, his data unassailable, and his conclusions delivered without regard to whom they might offend or support. He was a man of the earth, a geographer and historian by training, and his opinions were always rooted in the earth, in the facts on the ground. He lways connected me with the true Middle East, that often irrational, tribal world where people only do the right thing for the wrong reasons. I first got to know Meron when I was the New York Times bureau chief in Jerusalem from 1984 to 1988. The fate of the West Bank and Gaza Strip was being hotly debated at that time. The question of the day was this: Had years of Israeli settlement building in the occupied territories gone so far as to inextricably knit Israel, Gaza, and the West Bank together, or could one still speak of Israel giving back these areas one day, despite the degree to which they had been integrated into the economic and political life of the Jewish state? One of the remarkable things about that debate, though, was that for all its centrality in Israeli political life and for all of the attention it got in the international media, very little hard data had been assembled to inform the arguments of either side. Wishful thinking was the currency of this debate. That was what led me to Meron's door. Working out of a small apartment, with a computer and a few researchers, he combed through Israeli government budgets, official abstracts, agricultural and water data, and brought them all together in something called "The West Bank Data Project," which painted a statistical picture of developments in the occupied territories. On a per capita basis (number of times quoted divided by the number of researchers involved), the West Bank Data Project, founded in 1982, was without question the most influential think tank in the debate about the occupied territories. Meron's conclusions alternately drove each side in that debate crazy and provided them with the statistical resources for their best arguments. So, for instance, the settlers used to love to quote Meron's statistics about how deeply their rising numbers had sunk roots into the territories and how impossible it would be to expel them. But it drove them crazy when Meron showed how much it was costing the Israeli taxpayer to bus settler schoolchildren from their caravan homes on some remote hillock in the West Bank all the way to Jerusalem, where they could attend Jewish classes. The Palestinians hailed the West Bank Data Project for cataloguing just how much private and state land previously under Arab control had been expropriated by Israel since 1967. But it drove them crazy when Meron warned them that their maximalist approach to diplomacy and refusal to take half a loaf in order to slow Israeli settlement activity were tantamount to national suicide. While the peace talks remained deadlocked, he argued, the relentless worker bees of the Israeli settlement movement were throwing up prefab home after prefab home, making it harder and harder ever to separate Bethlehem from Jerusalem, or Tulkaram from Tel Aviv. Meron was probably the most oft-quoted and oft-damned analyst in Israel in my day—Jeremiah and Jonah wrapped into one. As time went by, though, Meron tired of being the reality principle for a debate in which no one was really interested in reality. So, much to the chagrin of journalists such as myself, he gave up the West Bank Data Project and began a life as a writer. Now, instead of providing the data for others to write about the territories from one political perspective or another, he deploys his own data in service of his own unique perspective. This book is one of the results. Meron's perspective is informed by his training at Harvard University as a political scientist, nurtured by his tenure as deputy mayor of Jerusalem from 1973 to 1978, and inflamed by his passion for the people, the stones, and the history of the land of Israel. 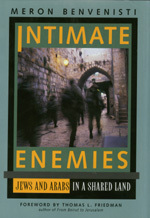 For years I had been after Meron to write just such a book as Intimate Enemies. Indeed, his stubborn refusal to do so really annoyed me. He was like this brilliant doctor whose clear-sighted ability to diagnose the heart of the problem, without even an x-ray machine, left you speechless. And when you asked for a prescription, this brilliant doctor said he did not do prescriptions. "But, doctor," you said, "the patient is ill, quacks are dispensing advice from soapboxes on every corner. Don't leave him like this." But he would just shake his head. He did not do prescriptions. Well, with this book, the doctor is finally in, and I am glad he is. To understand this book, the reader must understand that Meron is what I would call a "tribal realist." That is, his view of the world, and the Arab-Israeli conflict, is essentially that humans are tribal beings and that tribal bonds, passions, memories, symbols, allegiances, and connections to pieces of land are the DNA building blocks, the double helix, at the core of Arab and Israeli behavior. What Meron does in this book is take two very primordial tribal encounters between Israelis and Palestinians—the massacre of Palestinians by Israeli police on the Temple Mount in October 1990 and the handshake between intimate enemies Yasser Arafat and Yitzhak Rabin at the White House three years later—and posit them as the competing models for the future of this conflict. It is either the raised fist or the outstretched hand. There is not much in between. While Meron does not write out an explicit prescription for avoiding the former in favor of the latter, one can be gleaned from his analysis. Meron acknowledges that as a tribal realist he was taken a bit by surprise by the Arafat-Rabin handshake. Being a man so rooted in the land of Israel and so sensitive to others' connections to the land and its symbols, he never believed that Arafat would surrender or that Rabin would accept that surrender and then live with a defanged PLO. What Meron missed in the past (which he acknowledges in this book) were some of the large historical forces that reshaped Israeli and Palestinian attitudes, despite their tribalism—forces such as the collapse of the Soviet Union and the Gulf War, which deprived Arafat of his economic lifeline. For Israelis, it was exhaustion with this conflict produced by the combination of the Palestinian uprising and the rising Israeli standard of living. This last factor—a growing desire among Israelis to separate themselves from the Palestinians so that Israeli society could live the good life without them—was critical in shaping an Israeli majority in favor of The Handshake. In other words, it was the nightmare of extinction for Arafat and it was the dream of separation for Israelis that combined to produce this breakthrough. But Meron insists that while he may have missed some of the forces producing that embrace at the White House, the tribal elements have not gone away; they have been temporarily muted. And he is right. The dream of separation is possible in Gaza, a neatly self-contained unit. But how will it be fulfilled in Jerusalem and the West Bank, where the Jewish and Arab populations are so much more intertwined, and the symbolism of every stone is so much more potent? And if there is to be lasting separation, can it be based on Palestinian surrender? No, he essentially argues, it cannot, for there must be an element of equality in any final Israeli-Palestinian deal; otherwise a separation is no more sustainable than a divorce without an equitable division of property. The short-changed spouse will always be resentful and will come back to the judge for more. And that gets back to the choice between the Temple Mount and the White House lawn. The Temple Mount represents the rage that is produced by a separation based on inequality; the White House lawn represents the hope inspired by separation based on equality. So Meron leaves us with these three options: Will it be a continuation of the shepherds' war between peoples fated to share the same sidewalks, but who want it all. Or will it be the shepherds' pie, divided, slice by slice, not in equal shares but in shares based on the power relationship between the parties—meaning that the Jews will get the lion's portion, the Palestinians the beggar's bowl. Or will it be some third option—the Benvenisti option—call it shepherd's stew, in which Israelis and Palestinians somehow learn to share equally the territory of historic Palestine west of the river Jordan. Meron describes this dream as one in which Jewish and Palestinian "cultural relations, human interactions, intimate coexistence and the attachment to a common homeland will be stronger than militant tribalism and segregation in national ghettos." Those who dream of such coexistence, Meron adds, "are entitled to suggest a system that combines ethnic and cultural separation within a common geopolitical framework." Thomas L. Friedman is Foreign Affairs columnist for the New York Times and author of From Beirut to Jerusalem. When a plot gets hopelessly tangled in classical Greek theater, a large box drops from the flies. From it emerges one of the gods. He ties up the loose ends, and the play, which has already gone on too long, reaches its anticipated denouement. Not that the dilemmas have been resolved or the ways of fate understood, but the audience can go home with its catharsis. After all, they were not looking for an answer, only for consolation. And tomorrow there will be another play. Although the ancient Greeks may have invented the deus ex machina, it is perhaps the Semites who have developed this dramatic technique to supreme perfection. In the ongoing drama of the Israeli-Arab conflict, both the critics and the players have dispensed with plot. For them, history is nothing but an endless series of unexpected events. The god from the machine constantly intervenes to fake a resolution of the story's complications, one sufficient to allow the curtain to come down, or go up, as required. Pious hopes and towering fears are postponed to the next act, and so it goes on. The agonized audience, whose distress these rituals presume to express, does not dare question the tragedy's basic structure. It wants to forget the dissension and violence of the present, to fight off despair, to turn a blind eye to the ominous contradictions—and yearns to put off all its dreams and nightmares until tomorrow. Journalists and authors of political texts, commentators and thinkers, all gladly offer the people in the theater the illusion of "the inevitable development"; they provide diversion and comfort. No one will take them to task for having complicated the plot they have concocted. When necessary, they will again bring down the deus ex machina, to once more remit their errors and their self-righteous preaching. Only a few will dare say, in an undertone, that the deus ex machina is nothing but a fraud, and that only the worst of dramaturges would use it. Only a few will remonstrate that tomorrow is already here, that the tragic Israeli-Palestinian plot is cyclical, not linear, because its causes are fixed and existential. Everyone will shout them down. As early as April 1990, a few months before Iraq overran Kuwait, Saddam Hussein threatened Israel with "binary chemical weapons" and bragged of his ability "to burn half of Israel." At the time attention was focused on the Intifada, especially on its murderous manifestations. Not long before, a young Jewish man had fired indiscriminately into a group of Arab laborers, and two Jewish boys had been kidnapped and murdered in Jerusalem. The Iraqi dictator's threats were dismissed as more of the baseless bravado he was known for. The right-wingers who did take note of them were dismissed as warmongers and the enemies of peace. The Palestinians were still playing their cat-and-mouse games with the Israeli army, but were exhausted after thirty months of Intifada; they heeded the voices from the north. The protagonists in the Israeli-Palestinian conflict were ready for the descent of whatever god was on duty, but the chorus was still declaiming the old refrains. Shortly after Saddam Hussein invaded Kuwait, Knesset members from the parties of the left and from Labor met in Jerusalem with Palestinian leaders from the territories and adopted a "joint statement of principles." The first section of the document stated unambiguously: "The Israeli-Palestinian conflict is the heart of the Middle East problem and must be solved immediately." Some of the less dovish participants wondered whether the document was an analysis of the situation or simply wishful thinking. They wanted a reference to the occupation of Kuwait and "demanded unambiguous condemnation of the action." A Palestinian spokesman told them: "We haven't come here to solve the problems of the world, only the Israeli-Palestinian conflict. . . . The occupation of Kuwait is an internal Arab matter." In the end, the meeting, described as "positive and constructive," did not address the approaching Desert Storm. Those assembled continued to work on "the heart of the matter" and appointed a drafting committee that was supposed to address unresolved questions, such as the Palestinian right of return, the status of the PLO, Jewish immigration, the question of borders, and Israeli security. "We're talking about an exceptional meeting," enthused one of the leading Jewish participants. "If the people who participated were those responsible for reaching a peace agreement, it would happen soon." As Israelis and Palestinians negotiate separation and division of their land, Meron Benvenisti, former Deputy Mayor of Jerusalem, maintains that any expectations for "peaceful partition" are doomed. In his brave and controversial new book, he raises the possibility of a confederation of Israel/Palestine, the only solution that he feels will bring lasting peace. The seven million people in the territory between Jordan and the Mediterranean are mutually dependent regarding employment, water, land use, ecology, transportation, and all other spheres of human activity. Each side, Benvenisti says, must accept the reality that two national entities are living within one geopolitical entity—their conflict is intercommunal and will not be resolved by population transfers or land partition. A geographer and historian by training, a man passionately rooted in his homeland, Benvenisti skillfully conveys the perspective of both Israeli and Palestinian communities. He recognizes the great political and ideological resistance to a confederation, but argues that there are Israeli Jews and Palestinians who can envision an undivided land, where attachment to a common homeland is stronger than militant tribalism and segregation in national ghettos. Acknowledging that equal coexistence between Israeli and Palestinian may yet be an impossible dream, he insists that such a dream deserves a place in the current negotiations. Meron Benvenisti was Deputy Mayor of Jerusalem under Teddy Kollek from 1971 to 1978 and administered largely Arab East Jerusalem. In 1982 he established the West Bank Database Project. Currently a columnist for Haaretz, Israel's largest newspaper, he is the author of numerous books, including Conflicts and Contradictions (1986). Thomas L. Friedman has won two Pulitzer Prizes (1983, 1988) for his reporting from the Middle East. He is the author of From Beirut to Jerusalem (1989), which received the National Book Award for nonfiction.